Modern search marketing, both paid and organic, requires you to understand searcher’s behaviour and intent. Since the Humming Bird update, Google algorithm has moved on from keywords and now looks at the overall intent of a search query to rank pages and websites that best answer the query. Google’s paid search advertising program, Google Adwords has been using quality score for many years to reward advertisers with ads that best answer’s the searcher’s query. Therefore, it is very important to understand patients’ search behavior to promote your dental practice successfully with search engines. Dental patients use one of 3 types of search queries to find information about dental treatments and local dentists. Before researching and selecting keywords for SEO (or PPC), you must understand each of these 3 types of search queries to attract maximum number of dental patients to your website. It is not possible to rank organically for navigational searches since they contain branded keywords that refer to existing websites. However, you can show your ad for these searches by bidding on these keywords in your Google Adwords campaigns as shown in the screenshot below. 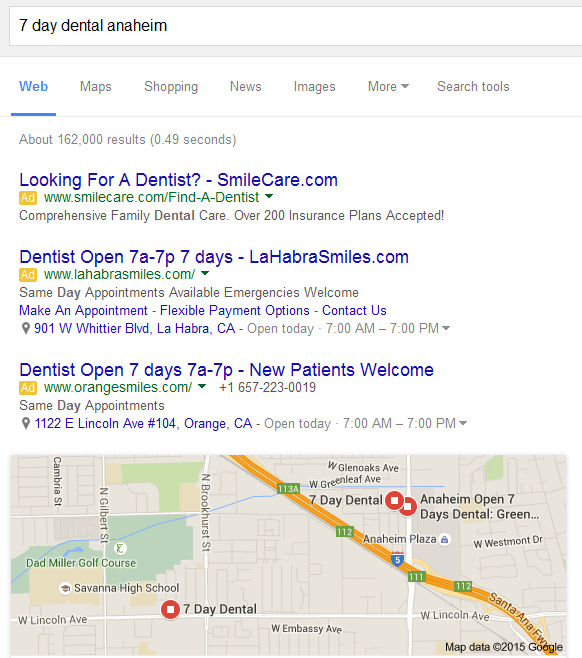 If you are a local competitor of 7 Day Dental then it makes sense to pitch your clinic’s offer to somebody searching for their website. Also it is recommended to bid for your practice name, website and branded keywords to avoid other competitors from ‘stealing’ your patients. 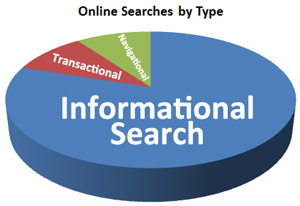 You should research informational searches related to the various procedures offered at your dental office. Then create content like articles, videos, animations, blog posts, infographics on each major topic and publish this content on your dental website. Over time you will develop a content rich website that gets thousands of unique visitors looking for information about various dental topics. Many of these visitors will become your patients. As a dentist, targeting these searches should be your top priority using SEO, PPC, Local SEO and anyway possible. You should optimize your website to rank high for these type of searches and also run PPC ads for them so you have at least 2 listings (1 website + 1 ppc ad) showing up whenever somebody uses that search on Google.